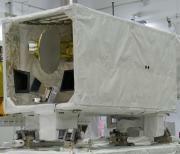 SMILES is the first sensor to observe the global environment in "KIBO". 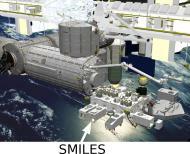 SMILES takes full advantage of the exposed facility of the ISS platform. It comes equipped with a heavy submillimeter-wave cryogenic superconducting receiver that proved difficult in conventional small lightweight satellites. By taking full advantage of its splendid high-sensitivity technology, the equipment observes the global environment with a high degree of sophistication. 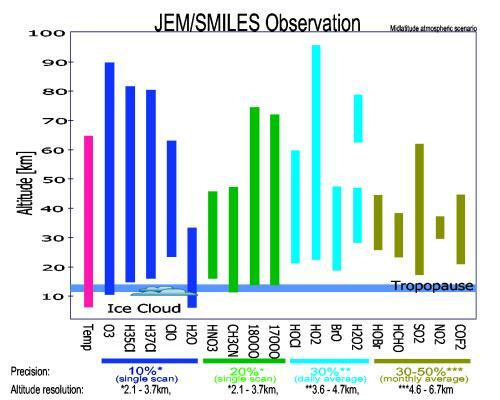 Checkup of the earth atmosphere SMILES observes the atmospheric compositions with unprecedented high precision. Data obtained through SMILES observation helps us unravel complicated atmospheric chemical process, and understand and diagnose the present state of ozone depletion, global warming and air pollution in detail. 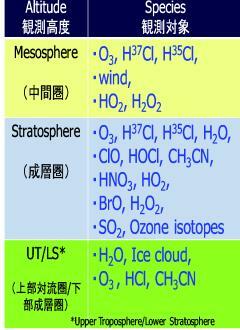 The water vapor, ice clouds, ozone, and HCl isotopes at an attitude of about 10km (upper troposphere and lower stratosphere; UT/LS) are simultaneously observed to acquire a deeper understanding of UT/LS exchange process, chemical processes, and new knowledge of climate change. SMILES made the world’s first observation of atmospheric minor constituents’ global distribution at an attitude of 50-90km (mesosphere). For example, we observed for the first time in the world that distribution of chlorine monoxide (ClO), which damages the ozone layer, has changed significantly under the influence of sunlight. ClO at an attitude of 30-50km (middle/upper stratospheric) has shown a diurnal behavior with an enhancement during daytime. Contrarily, mesospheric ClO has shown a different diurnal behavior with an enhancement during nighttime. Potential of SMILES observation data has just been unlocked. We will keep transmitting such new knowledge to the world. Targets of SMILES observation are ozone（O3） and the key species for the depletion of the ozone layer or atmospheric pollution, such as hydrogen chloride (HCI) and chlorine monoxide (ClO). The right figure shows the precisions and altitude ranges of compositions observed by SMILES. 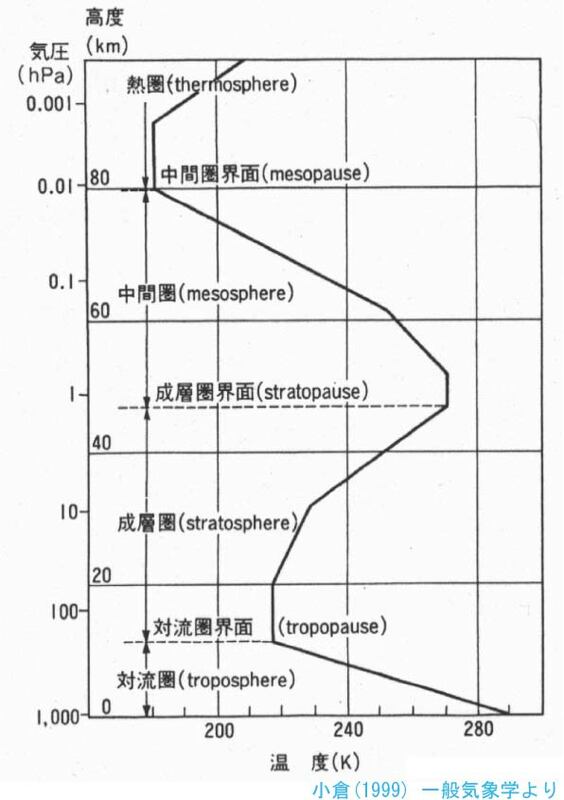 The abundance altitude distributions of 16 compositions are continuously observed on a global scale over a wide altitude range. O3 and HCl are detected theoretically within an error of a few percent. ClO, for which observation was previously considered difficult, short-life substances such as BrO, HO2, HOCl are now detected with an error margin of 20 to 30%. It is also interesting to detect humidity and ice cloud in the upper troposphere, and forest fire emissions CH3CN with high precision. 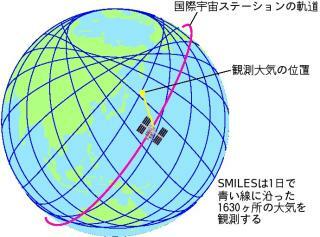 Since the International Space Station in which SMILES was installed has a non sun-synchronous orbit, SMILES observed for 24 consecutive local hours without being bounded in a specific local time like sun-synchronous orbits satellites. This enabled us to observe diurnal change and it is important to understand, especially behavior of short-lived atmospheric compounds, such as ClO and BrO. SMILES is installed on the Exposed Facility (EF) of Japanese Experiment Module "KIBO" on the International Space Station （ISS） and it detects emission from the atmosphere in the submillimeter-wave region. The International Space Station (ISS) orbits at an altitude of 350 to 400 km above the ground and completes a single earth orbit in about 90 minutes. It is a non sun-synchronous orbit with an inclination angle of 51.6°. Smile observes atmospheric limb emission of the submillimeter-wave region about 2,000 km obliquely downward direction along the flight direction of ISS. It observes the atmosphere tangentially stroking the atmospheric limb. SMILES detected spontaneous emission from the atmosphere in the submillimeter-wave region. SMILES prospects the earth atmosphere by detecting emission from the limb submillimeter-wave region, the instrument is, therefore, called a "superconducting submillimeter-wave limb-emission sounder". The antenna FOV diameter is about 3km in a vertical scale at tangent point 2000 km ahead. 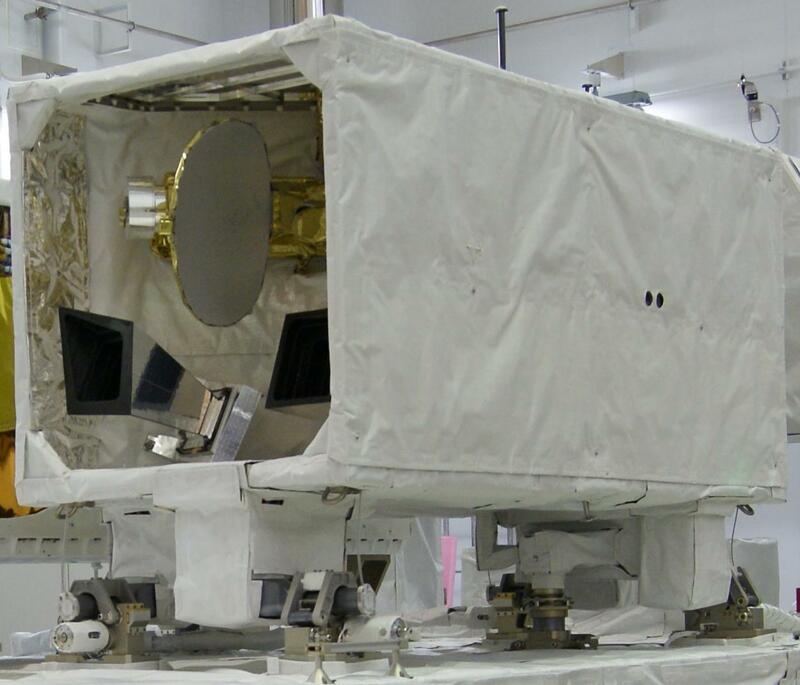 SMILES scans the antenna to sweep the limb atmosphere vertically between the bottom of the atmosphere and the upper atmosphere where there is almost no air, and detects submillimeter-wave radiation which contains information of various attitudes. SMILES performed this antenna scan with a time period of 53 seconds and observed about 1,630 observation points per day. Because ISS is in orbit around the earth and the earth rotates in its axis, SMILES can monitor the atmosphere almost whole area of the earth in a day. 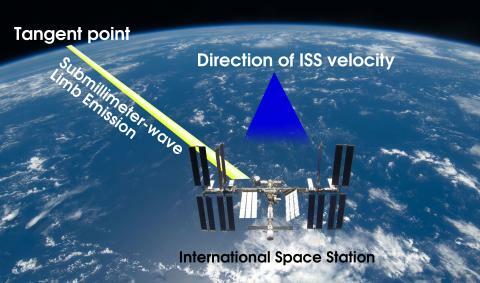 Since the antenna beam is tilted left from the direction of orbital motion, the latitude range of the observation covers from 65 degree north to 38 degree south (if ISS is in a prograde orbit). Copyright(C) National Institute of Information and Communications Technology. All Rights Reserved.